A sudden burst of coloured lights shines on the electric guitar, augmenting its reverberations. As a whispered ballad builds into a frenzied song, everyone on stage gets into an agitated state. The drummer hits his instruments with fierce rhythm, the backing vocalists produce psychedelic sounds and the lead singer closes his eyes as he journeys towards a powerful crescendo. The open-air theatre at Karachi’s Arts Council is afire on this summer night in 2014. The audience – mostly young boys and girls – is loving the line-up of artists. They swing and sway in appreciation; they cheer and shout in approval. And they are as restless as their beloved performers. In their excitement, they move about, meeting friends, taking occasional dance steps, raising their hands in approval of a performance. The air is electric yet casual. It is charged yet carefree. Random household items – lamps, bean bags, carpets, a rocking chair – are scattered on the stage, creating a lounge-like environment, further enhancing the happy-go-lucky feel of the night. 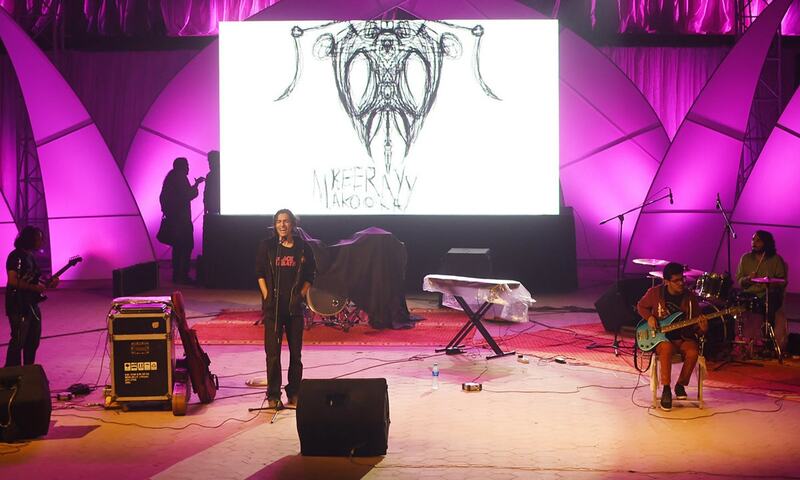 Earlier in the day, Nadir Shahzad, the lead man of the experimental folk-rock band Sikandar ka Mandar, was scuttling about the same venue edgily, trying to put everything in place for his performance. He was testing the speakers at one moment; at another, he was getting the lemonade stall’s signboard put in the right place. As other members of his band ran around to put finishing touches to the arrangements, the few onlookers did not know that these very people would be regaling them with music a little while later. Shahzad himself would transform — from a laid-back young man in a black T-shirt to an energetic singing sensation in a white kurta shalwar, fully in control of the situation. 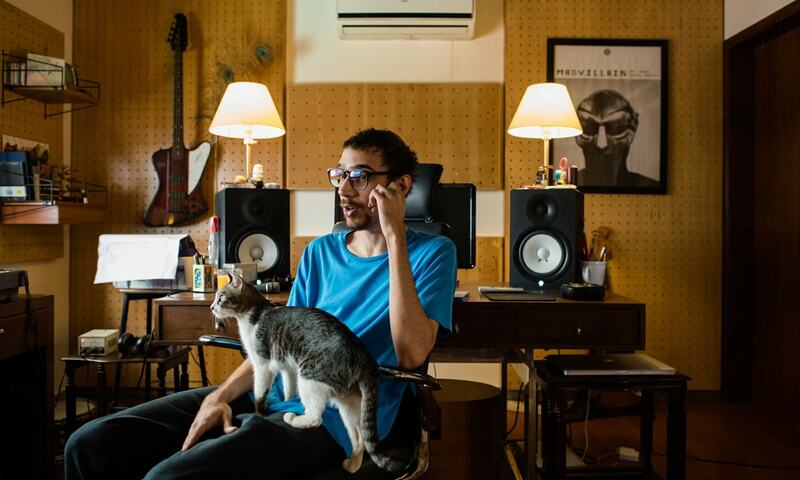 For rapper Faris Shafi it is this do-it-yourself spirit that distinguishes independent music from its mainstream commercial cousin where others do the running around for the musicians. Independent music happens when “the artist handles the funding, promotion and distribution of his music himself”. But that, according to him, describes only one half of what independent music is. The other half consists of a seminal requirement: “The musician must be creating original music.” No cover versions for the classics, no remixes of the old songs. For a country where music tradition is split into two disproportionate parts: the massive one following film songs, folk tunes and the classical tradition; and a minor one treading a road that ultimately travels far and wide out of Pakistan to other countries, other continents. It is within this minor part that the independent music scene is located. Due to such considerations of size, independent music in Pakistan will never have it easy — not that independent musicians elsewhere have it any easier. Produced and consumed by a small niche within a smaller niche that is attuned to Western-inspired music genres, rhythms and tunes, this type of music will always have a very narrow band of population as its listeners — the Pakistani “yuppie”, with an English-medium education, a trained ear for heavy metal and digital music, and half an eye open to the possibility of leaving the country for western pastures. 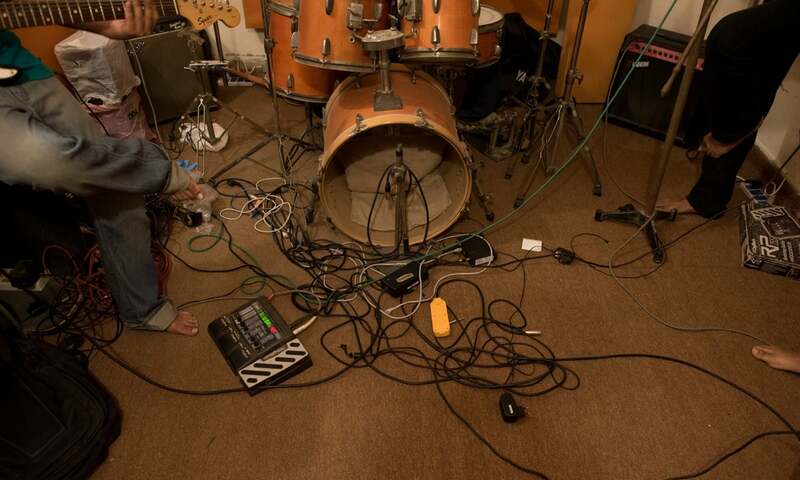 Lahore-based producer and musician Mekaal Hasan says the commercial mainstream of Pakistan’s guitar-and-drum music industry primarily consists of “commissioned music such as songs for drama serials, film scores and sponsored music shows like Nescafe Basement and Coke Studio”. 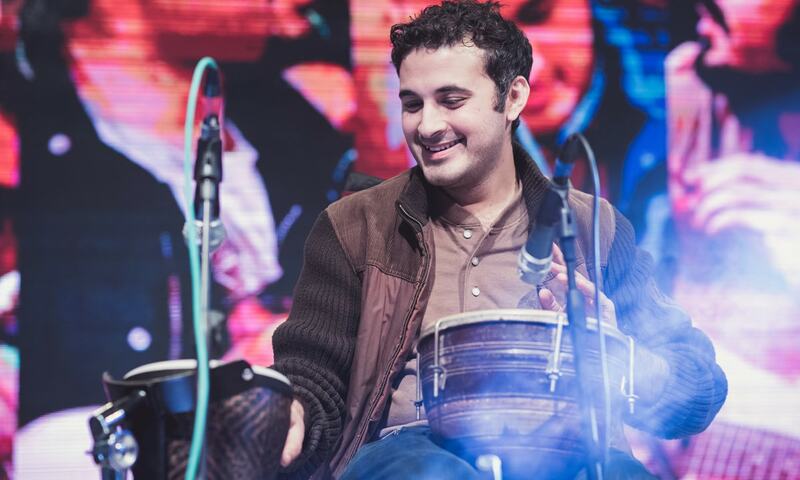 The tabla-and-harmonium mainstream, which dominates the airwaves, comprises what Waleed Ahmed of the band Janoobi Khargosh calls “Bollywood music”. It is, in other words, difficult to pin down what mainstream music in Pakistan looks like (and what shape independent music should take in relation to it). Many of those who could have helped the domestic music scene come together are themselves mostly working outside Pakistan. “The pity is that our big musicians no longer play in Pakistan. They are mostly signed up by the Indian labels,” says Hasan. Noori has run the entire gamut of whatever one can find in Pakistan’s fuzzy music milieu — from being an underground act that experienced commercial success in the early 2000s, to becoming an independent band releasing their own music to critical acclaim in recent months. Band member, Ali Hamza, therefore, knows a thing or two about what is what in local music. Our music environment is a “melting pot”, a mix of everything, he says. From commercially hit singers like Quratulain Balouch – QB for short – who is providing vocals to many television dramas, to Ali Zafar, Atif Aslam and Rahat Fateh Ali Khan who have made it big in the Indian film industry, and from the massively talented instrumentalist Usman Riaz to a myriad of small rock groups which produce and release their own music mostly through non-commercial online platforms — there is something for everyone. And yet, all this is not enough to be deemed as an industry. An artist here creates an “industry” by himself, says Hamza. With a thunderous crackling sound, the wooden boat starts sinking. All around it, the ocean is illuminated by flames. A little boy rushes past them, swimming himself to the safety of an island where he steps into a new world. He hears sounds and follows them. Soon, he finds a group of people chanting something in a rhythmic way. He listens to their music and allows himself to immerse in it — the musical chants pulsating through his veins. This is the dreamworld that gave birth to Janoobi Khargosh, the quirkily named Lahore-based indie rock band led by Waleed Ahmed. “I want my music to capture the land of dreams I inhabited and imagined as a child,” he says. It is a world that exists inside him and he has created it mostly in reaction to what he does not like in the real world. The nagging tunes of his music seem to embody his anguish, his existentialist questioning, and he tries to respond to his distress through his dreamy lyrics. Angst thrown in with unrushed, hummable melodies and vocals which probe rather than protest — this is how a Janoobi Khargosh song takes shape. Also read: "You have to give classical music a new tone to keep it alive"
For Ahmed, music is his response to his own hopes and dreams, ambitions and failures. He looks like he is trying his best to keep it to himself — and almost succeeding in doing so. With around 2,500 Facebook followers and a few hundred listeners accessing the band’s songs on SoundCloud – an online audio platform – Janoobi Khargosh is certainly not seeking a mass audience. Their music is independent, almost to a fault — they do not seem be able to reach a wider listenership. Many other independent musicians may not have sources of inspiration as esoteric as those of Janoobi Khargosh but their music is still derived from an inner reality only remotely and tenuously connected to the bigger world around it. Whether based on an internal utopia – or dystopia – or on an internalised foreign culture, the creative universe of many independent musicians exists mostly within and around them. In many cases, the appeal of their music also does not go very far from them. 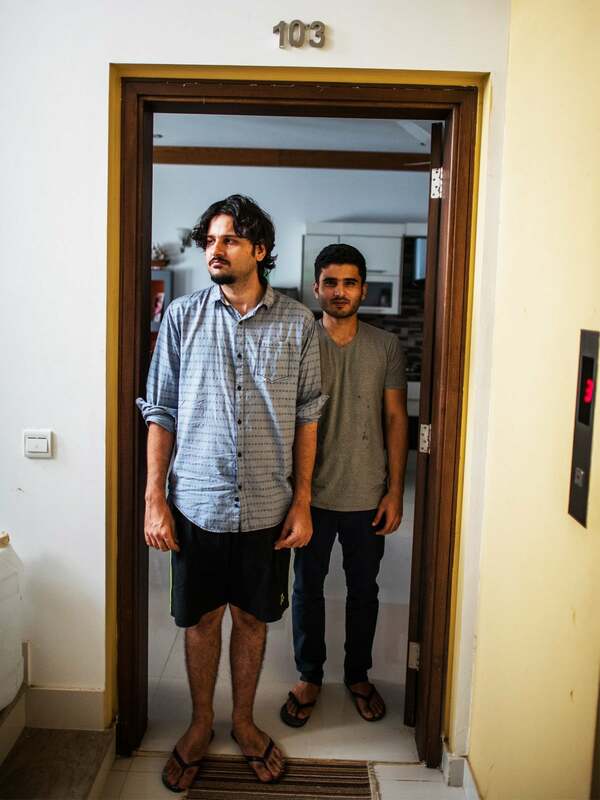 Musician Ali Suhail’s apartment, near the Arabian Sea in Karachi, houses a world of his own. The musician is both the producer and the product of this universe. With the sound of crashing waves and the noise of traffic wafting in through the window, he sits on a chair holding a striking yellow ukulele with a smiley face drawn across it. His fingers constantly strum the strings of the instrument and, every now and then, he lets his gaze drift towards the poster of a comic book hero on the wall. A Batman mask hangs in another corner, besides other images and icons taken from popular American culture. A small corner is taken up by a table, crammed with a computer, a monitor, small music instruments and plenty of sound equipment. This is where Suhail writes, creates and produces not only his own songs but also those by other independent artists such as Shahzad of Sikandar ka Mandar, Shajie Hassan and Natasha Humera Ejaz. While talking about his music, his eye suddenly falls on a record lying on a low table next to him — it is a Happy Banjos record by The Big Ben Banjo Band, a music group based in New Zealand. He picks it up and puts it into a record player. The record begins to play but it is so old that it unceremoniously starts to skip and repeat tracks. Suhail immediately records the sound of skipping. With the ukulele still in his hand, he plays an open note and then begins to work on a progression of notes. Enjoying the uninhibited sounds this creates, he continues to play without any structured chords. Gradually, a melody starts to take form almost out of nowhere. He immediately pens some lyrics and sings them. The vocals sound distant, as if emerging from a deep underground. A song has come into being. Khumariyaan can count on its music to sell locally — and also find foreign sponsors with cash to spare. 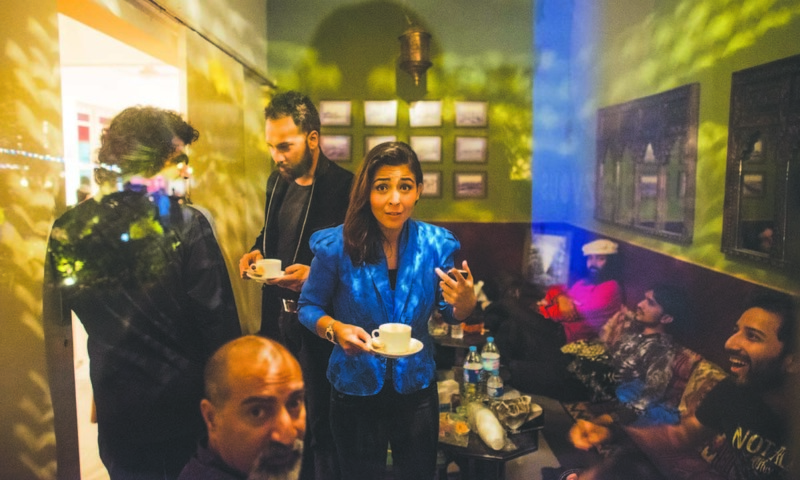 To their detractors, their music is addressed to donors happy to patronise an artistic endeavour in a strife-riddled society like Pakistan; their motto – “art for religious fundamentalism is like water for fire; mere existence, is a form of resistance”– insisting on the need for promoting arts and culture in a conflict zone. To their fans, however, Khumariyaan offers a perfect mix — “with a slight western inflection, culturally charged Pashtun folk melodies,” is how The New York Times described thier music after a performance by the band at the Asia Society in October 2014. Khumariyaan, however, has successfully cracked the code for finding non-corporate sponsors and invested audiences and, that too, in a tough industry struggling to get hold of both strings-free money and initiated listeners in the right amount. For Mekaal Hasan, this is exactly the success strategy he has been advocating for years. Pick up the richest parts of Pakistan’s artistic and cultural tradition, weave them with a musical ethos that celebrates harmony by bringing Western and Eastern instruments and ways of singing together, and showcase it to interested outsiders. The rationale for the appeal of such music is straightforward: there is definitely more to the society that is capable of producing such beautiful music than just mayhem and murder. The musicians need to look towards global opportunities, reiterates Hasan. They should try to avail chances for foreign tours and international performances, he adds. His own band’s experience in the United States – as well as those of Khumariyaan and Poor Rich Boy (and the toothless winos) – proves that international avenues are the best bet for those artists from Pakistan who are not looking to do music for television soaps or for Bollywood movies. As long as these two avenues constitute the bulk of mainstream music in Pakistan, Meekal Hasan Band and Khumariyaan will, of course, be justified in calling themselves independent acts. They are but just one end of the spectrum. On the other end of it are bands which invest meaning in their music by being truly independent in every sense of the term — though not in the aloof, spiritual way of Janoobi Khargosh or Suhail. They serve as the fearless critical voices of their own surroundings and have the ability to see from an artistic – as well as political – vantage point the goings-on underneath, with the objectivity of a satirist. They are Danger Baloch and his rap group, Lyari Underground (LUG). They create music about the gritty and brutal world of crime and acrimony around them. As their names suggest, theirs is a critical – in fact, satirical – take on the problems of ethnic division, gang war and discriminations that their tough Karachi neighbourhood has come to symbolise. And this is the only place in Pakistan where rap makes sense — a minority ghetto perpetually under the threat of being taken over by the big city around it. LUG is, thus, the rightful inheritor of the music tradition that African-American rappers started in 1979 when New York City built an expressway through their neighbourhoods. Baloch, a politically aware 21-year-old, exudes the fearlessness that his group’s song Ryasat o Syasat (the state and politics) embodies. He is too angry to articulate his opinions in full sentences and too agitated to be bothered about being decent in diction — like any other rapper anywhere in the world. He believes that this is the only way to criticise and satirise the state that has never shied away from pilfering the rights of the Baloch. And like his rap counterparts elsewhere, the cultural ethos of his music is a replication of the same troubled environment that he so vehemently opposes as a construct imposed by the exploitative authorities. He is not looking for fame and fortune. He is looking for a way to express his pent-up political opinions. The political is personal for him. 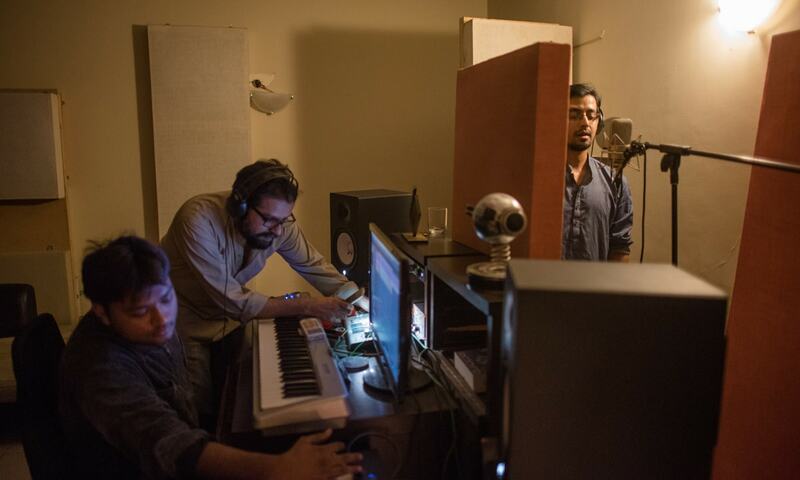 Baloch and LUG may soon fade as so many other politically-charged underground music acts from Lyari have since they first began emerging in the wake of Benazir Bhutto’s 1986 arrival in Pakistan from exile. 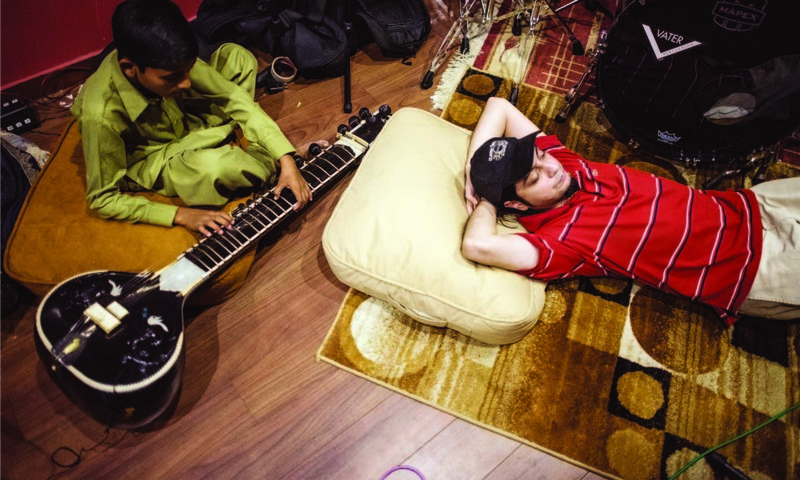 Time changes, politics changes — and so does underground music in Lyari. 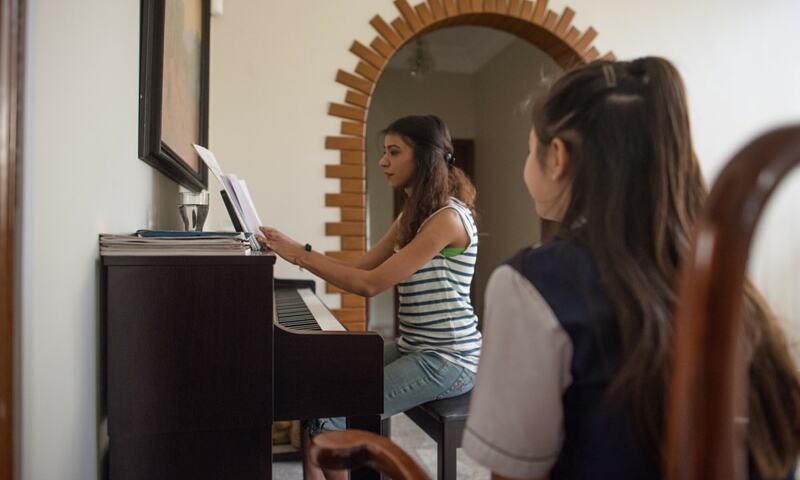 Zeerak Ahmed sits on the floor of her dimly-lit but welcoming bedroom studio in Karachi, she closes her eyes as she intently listens to the voices battling for space in her mind. As the vocalist, producer and songwriter who goes by the name Slow Spin, Ahmed is one of the few musicians in Pakistan who produce electronica music — a mixture of human and instrumental sounds passed through digital synthesisers to turn them into staccato, half-choked, robotic expressions alternating for a rhythm. While her lyrics are not entirely audible, the music conveys the sense that it is emerging from a very personal space. And she is happy to keep it personal. She does not want to use lyrics in Urdu if that is the only way to reach out to an audience outside herself. That will be unnatural, she says. Instead, she will keep writing her songs in English because she does not like to be dishonest in her expression. Her music may remain confined to a smaller audience but Ahmed is not troubled by that. Keeray Makoray’s jazz-infused rock music seems a huge distance away from Ahmed’s soft, digitised, private rhapsodies. Yet, it faces similar barriers in accessing a wide audience that Ahmed does. Is it the instruments they use? Is it the tunes and rhythms they employ? Is it the political content of their music? What is it that is discordant, that is not letting them strike a chord with the kind of audience that a band like Noori attracts? The answer, perhaps, lies in their heavy borrowing from the African-American music and American politics of the 1960s. Both those things are relevant to Pakistan — but only in snatches. “In the late 1960s, we saw that music was no longer about dance the world over. People wanted to say something also,” says Menezes about the importance of the twin cultural influences of those bygone years. 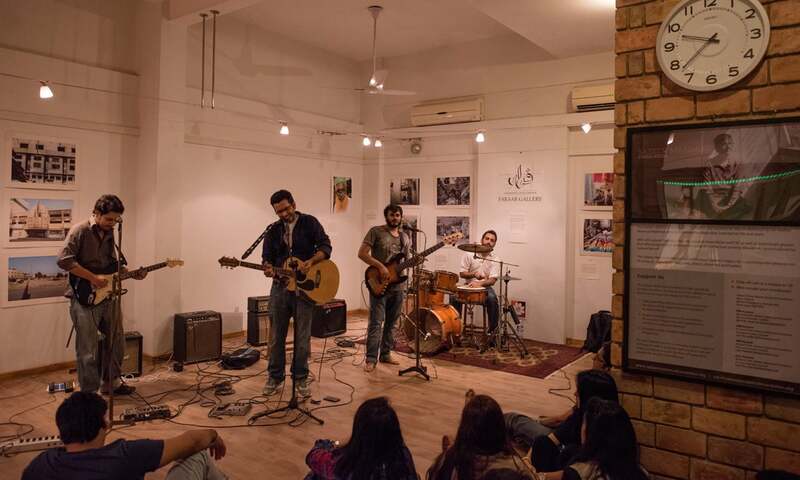 Ahmed Zawar and Qumber Kazmi are part of Karachi-based rock band E Sharp. 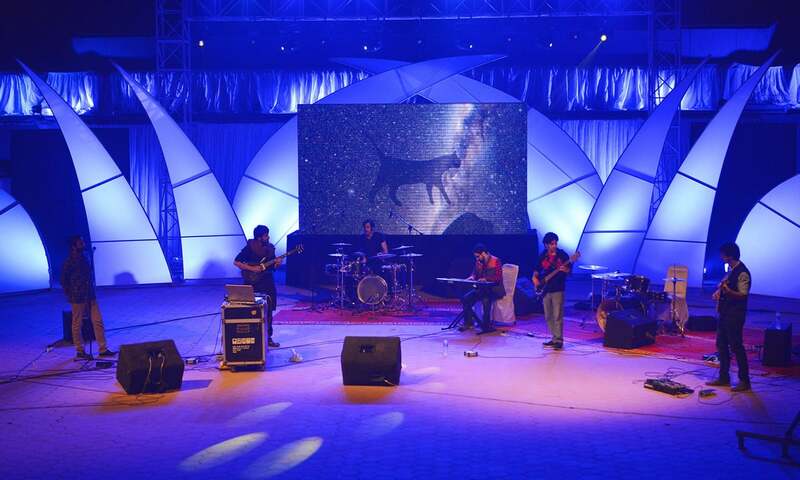 On a summer evening in 2015, they set out in a car to deliver their album, Bahadur Yaar Jung, to someone who has sent them an email request for the delivery. When they reach their destination – a multi-storey building in Karachi’s Nazimabad neighbourhood – they ring the doorbell to their client’s flat and soon a basket is lowered from an apartment window with 200 rupees in it. They pick up the cash and place the CD in the basket, which soon disappears behind the window. In a four-hour long trip, they deliver about 30 CDs. Since the release of the album in 2015, they have sold about 125 CDs this way. This may not be the most viable method for marketing music, but the E Sharp members believe this, in the long run, may create a culture of paying for music. And – with their catchy rock tunes, accompanied by their saucy politically and socially aware lyrics – they may find a market of sorts among youngsters. They also have a precedent. When Noori released their latest album CD, Begum Gul Bakaoli Sarfarosh, it was lapped up in thousands. But then Noori is an exception – they have nearly 500,000 likes on their Facebook page and their live performances always draw massive crowds. They are an independent act only in the sense that they are not backed by a music company or a corporate sponsor. Other than that, Noori is as commercial as any other commercial musician in the country. The soulful unadorned young voices of the two brothers – Ali Hamza and Ali Noor – echo each other. Guitars are the only accompaniment they have on stage. The audience sings along as the songs waft over the venue. A few more numbers follow. And then, with no prior warning, the two musicians run off stage. Fans just follow them. Many leap after them with autograph books and cameras tightly clenched. In this 2003 concert in Karachi, Noori is as emotive and exciting as it is always known to be. In the same city, 12 years later, traffic outside a shopping mall in Clifton has been piling up for half a day. Inside, music lovers gather in elegantly patterned rows. Noori is not performing here. Its members are here this October day to sign CDs of their latest album. Hamza and Noor are all smiles as they interact with their fans. A stream of young people seems to be entering and exiting the mall in an endless flow. Noori successfully combines the two opposite poles of the independent music scene in Pakistan: their music is as personal as it is political. The origins of the melodies and lyrics are deeply personal – songs they heard, books they read and stories they were told as children – but the content is strongly rooted in the political history of the homeland. They have also adapted their Urdu verses to Western music skilfully and infused their guitar strums with an Eastern sensibility acquired under the tutelage of their illustrious grandfather, Raza Kazim, one of the most well-known aficionados of the indigenous music tradition. Hamza, however, attributes his band’s success to external triggers. “A lot of it is associated with opportunity” created by the arrival of satellite-based television channels in Pakistan in the early 2000s, he says. Noori was able to hit the airwaves with its heart-wrenching melodies through multiple music channels that suddenly became available to the Pakistani audience. The explosion of music channels, indeed, brought with it, what Hamza calls, “an entirely fresh and diverse set of bands” such as EP, Fuzon, Mauj, Aaroh, Mizraab and, of course, Noori. Each of these bands had their own distinct voice and specific audience. Most of them, however, were unable to convert the first flush of success into a sustainable creative endeavour. Some of them were not interested in sustainability, and that is where the problem is, at least partially. No one is willing to take the initiative to build the infrastructures to address the problems of music piracy and royalties, says Naqvi of Patari. Consequently there has been no systematic effort at creating a music “industry,” he explains in a conversation with the Herald. From doing-it-yourself to believing-in-yourself, what remains constantly at the core of independent music is self — the artist. The only infrastructure that one can speak of consisted of a couple of music companies – most prominently Sadaf Stereo and EMI – and a sole record label — Fire Records owned by the Geo Television Network. While Sadaf Stereo and EMI have been generally concerned with older music, Fire Records hindered its own evolution by offering rigid contracts to musicians, seeking to control their concert performances and payments for tours and live gigs. And then, in March 2007, came the flood of political instability starting with the sacking of then Chief Justice Iftikhar Muhammad Chaudhry. Riding on the high tide of this political deluge – which was augmented by the assassination of Benazir Bhutto and the occupation of Swat by the Taliban – were news channels that drowned out avenues for non-news-related media products including music. This flood also washed Fire Records away. 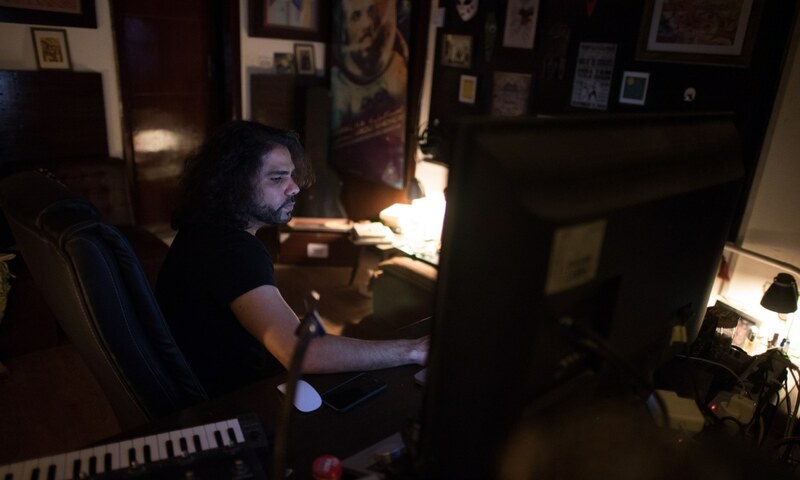 It is dark inside Zohaib Kazi’s home studio. A poster on the wall behind him carries the image of a deep blue and stark red space – an imaginary planet – brightened in patches by random lavender and purple lights. And amid the glow, Kazi is silhouetted as the sole occupant of the planet he has named as Ismail ka Urdu Sheher. This is the poster of his music album. Apart from being a musician, Kazi is also an associate producer at Coke Studio, lionised as the biggest platform in Pakistan for introducing new talent and revising the old one. Coke Studio, he says, works within a certain vision that it is trying to uphold. From the outside, this vision feels like a mixture of the raw and the mature, of classics and covers, of folk and rock, and of East and West. Throw in a little bit of spirituality that was its signature ethos under its previous producer, Rohail Hyatt, and the mix one gets is a perfect reproduction of the very confusing Pakistani music scene in miniature. Kazi, however, argues that Coke Studio, despite its bewildering breadth, is not enough to sustain the domestic music scene. Every entity and individual needs to make an effort to carve out paths for a yet-to-be-born music industry in Pakistan, he says. Hasan says the same thing, though in a different way. “A television show cannot create a community of artists,” is his take on Coke Studio. It should be one “part of the cultural fabric but it cannot be the only thing”. Guys, I need you all to decide what colours you will wear tomorrow,” says Raania Durrani, artistic director and co-founder of Salt Arts, a do-it-yourself management company. “Red is mine. No one else wears red,” shouts Ahsan Bari, the lead vocalist of Sounds of Kolachi band. A day later, the backstage is humming. Bari is dressed in a short red kurta; sarangi player Gul Muhammad is sitting silently, as if immersed in meditation and backing vocalist, Natasha Beyg, is practicing. Her eyes twinkle as she launches in to a conversation with bassist Sameer Bakhtiari. An announcement booms out from the stage: the band members are being called to perform. As the performance begins at Karachi’s Alliance Francaise on an October evening, the atmosphere is festive. Jubilant members of the audience make their way to the front of the stage to dance along or to cheer for a guitar solo by Faraz Anwar. One audience member suddenly shouts: “Is the drummer just this happy or is he always high?” Drummer Ahad Nayani, sporting a wide grin and a French beard, grins even more widely and continues to beat the drums with his sticks. It is not a music festival, though it has all the trappings of being one — a not-for-profit venue, a popular local band, and a small management outfit run by artists and musicians, readily and happily dispensing advice and making arrangements for fellow musicians for almost no financial considerations. Also read: What is Pakistani art? Hasan is unequivocal when he argues that the only thing that can turn music into a profession from merely being a passion is the holding of as many festivals as is possible. Music festivals can do what nothing else is capable of doing as far as institutionalisation of a music industry in Pakistan is concerned, he says. Events such as the Lahore Music Meet and Storm in a Teacup festival in Lahore, I Am Karachi Music Festival in Karachi and the Music Mela in Islamabad, to quote Naqvi, will help this industry to “organically develop”. Once an industry is created out of an art form, many independent artists may be able to sustain their music much longer than they do in the existing chaotic and uncertain times. But then also expect many other arts to move away from this emergent mainstream — to other isolated, personal and inwardly-geared artistic endeavours. For them, the urge to remain independent of any commercial considerations will be as seminal a part of their independence as the need to keep the corporate sponsors away. This was originally published in the Herald's December 2015 issue under the headline "The indie pulse". To read more subscribe to the Herald in print. The writer is a staffer at the Herald. She tweets at @zehra_nawab. In a society with increasing intolerance for anything skewing from the norms, one cannot expect to have a thriving arts scene. Arts fundamentally require a culture to have freedom of thought, whereby ideas flow in a free-form fashion. Pakistanis have lost touch with not just their liberal culture from the pre-Zia era, but also have very little knowledge about Islam. For some strange reason, we have equated arts with "kufr" and consequentially have cut-off our ties with anything that is remotely associated with the arts. Arts are just a medium to express creativity and to involve people in dialogue. Without those two, no country could prosper, no matter how strong their desire to prosper might be.